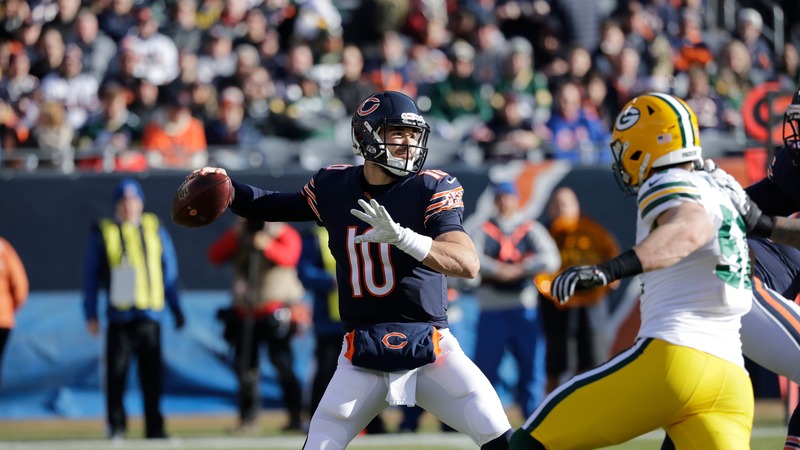 Quarterback Mitchell Trubisky has been playing his most consistent football the last three weeks, and that's good news for the Chicago Bears as they prep for Sunday's NFC Wild Card game against the Eagles at Soldier Field. Bears quarterback Mitchell Trubisky hasn't needed to do much the last three weeks of the season. Clinching the NFC North was a foregone conclusion after [a Week 14 win over the Rams](http://www.espn.com/nfl/game?gameId=401030817), and Chicago's defense has been locked in all season, meaning Trubisky only had to make a play here and there down the stretch to ensure the Bears stayed hot entering the postseason. Trubisky averaged 28 pass attempts the last four weeks of the season following a two-game absence because of a shoulder injurym, after averaging 32 attempts in the first 10 games. He also ran the ball less (an average of 4.25 carries the last four games compared to 5.1 the first 10), so he was able to protect his body better. Trubisky needed to use his legs more often than the Bears might have liked to help win games during the grind of the season. But as he enters his first postseason, he's playing the most consistent football of his short career -- and that has to be incredibly encouraging for the Bears and their fans. __Play to win:__ [Enter our free contests for great prizes and even cash! ](https://betchicago.chalkline.com/) The organization doesn't know how the 2017 second-overall pick will react to the playoff stage, but what he's done the last three weeks should give the Bears coaching staff a blueprint for how to handle him in the postseason. Trubisky still runs into problems the deeper into his progressions he's forced to go, so expect head coach Matt Nagy to continue running pass plays designed to get the ball out quick. Look for Nagy to mimic the game plan from Chicago's 14-9 Week 16 win over the 49ers, when Trubisky completed 25-of-29 pass attempts for 246 yards and a touchdown. Trubisky only threw five passes further than 10 yards in the air, and only two longer than 20 yards. He was also only hit five times on 30 dropbacks, a percentage they'll definitely take Sunday against Philadelphia. ! [pass-chart TRU215336 2018-reg-16 1545618871299](//images.ctfassets.net/p0ykbbcw3bn6/1vNJkQLZRO8Oa2CqAcsoQe/e2f0a12eb94bf5c3170519e94b2c4bda/pass-chart_TRU215336_2018-reg-16_1545618871299.jpeg) Since Trubisky threw three interceptions in the win over the Rams, it's been a pretty [typical-looking](https://nextgenstats.nfl.com/charts/player/2018/mitchell-trubisky/TRU215336/2018/16/pass) passing chart for the Bears. And Trubisky has completed 76 percent of his passes with only one turnover in the three games since. Still, Nagy will almost certainly take more downfield shots in the postseason, and Trubisky will be allowed to make more plays on scrambles, as needed. He may even have more designed running responsibilities, as the Bears try to diversify their offense. However, don't expect a huge departure from what we've seen down the stretch. Throughout the season, we've seen Nagy dial in what works in the context of the game, realizing the defense is always there to lean on in times of trouble. It'd be an unnecessary risk for them scrap everything that's gotten them this far. __More:__ [Bears vs. Eagles prop bets to consider](https://www.betchicago.com/bears-eagles-betting-odds-three-prop-bets) Long-term, Nagy may want the Bears to be more aggressive offensively, but when you go 12-4, you have to start eschew long-term preferences for whatever helps win now. It's a good problem to have. We'll still see Nagy throwing in wrinkles that make the Bears more difficult to defend. His short-yardage creativity has been a delight all season, and beyond just looking cool, those plays serve the practical purpose of giving defenses something weird on tape they'll then have to game plan for. But don't expect to see Nagy empty his playbook for the sake of looking like the most progressive offense. You don't get a trophy for that. Trubisky is your typical young quarterback. He's getting better in a number of areas, but still has issues in others. The Bears will continue to work on those over time, but the focus has shifted to taking advantage of his strengths in an effort to win a playoff game -- something the franchise has done only once since making the Super Bowl in 2006. __More:__ [Bears vs. Eagles betting lines and trends](https://www.betchicago.com/eagles-bears-betting-lines-trends-ats-pick-oddsmaker-nfl) Playing a somewhat risk-averse style puts additional pressure on the defense, but this is a defense that is built to have more asked of it than most. And credit Trubisky for making the necessary decisions to take some variability out of his game. When you're the No. 2 overall pick, it's natural to trust your talents and think you can make every throw or extend every play with your legs. It goes against his nature in many ways to avoid that, and it takes a special player to be able to weigh the risks in real time and only attempt them when absolutely necessary. But that's what Trubisky has done in recent weeks, and it's the mark of a guy who is [learning how to lead. ](http://www.espn.com/nfl/story/_/id/25670610/chicago-bears-qb-mitchell-trubisky-learning-leader-goes-nfl-2018) Because of that, he's playing his most consistent football. That doesn't guarantee he'll be able to replicate it Sunday against the Eagles, but it should make fans feel a little bit more comfortable that if the Bears defense does what's expected of it, Trubisky won't lose them the game. Somewhere along the line -- for a play, or even an entire drive -- he may have to do more. He's been able to [handle that](https://www.betchicago.com/mitchell-trubisky-bears-bailouts-packers) when asked. But on the whole, consistency is what the Bears need out of him, and that's what he's given lately.